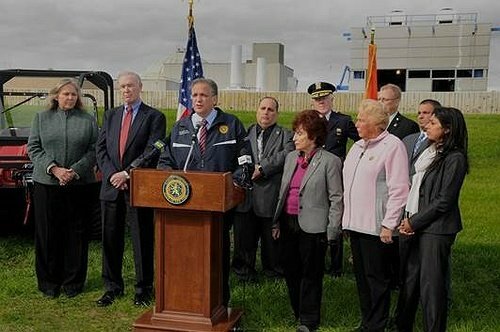 Nassau County, NY - October 27 2015 - With the 3rd Anniversary of Superstorm Sandy upon us, Nassau County Executive Edward P. Mangano, Presiding Officer Norma Gonsalves, Legislator Denise Ford, Legislator Howard J. Kopel and Legislator Rose Walker highlighted post-Superstorm Sandy mitigation and resiliency projects taking place throughout Nassau County. Perhaps the largest Superstorm Sandy recovery project in the nation, progress continues daily at the Bay Park Wastewater Treatment Plant in East Rockaway which serves 40% (550,000 residents) of Nassau County’s population. During the storm, approximately 50 structures, numerous mechanical systems and operating equipment were damaged. The plant’s electrical distribution and power generation systems were also rendered inoperable for 57 hours due to flood waters inundating electrical conduits via the bottom of the substation, overland flooding and through a surcharged drain system. The loss of power to the plant caused partially treated sewage to be discharged into East Rockaway Channel, which opens into Hewlett Bay, Hempstead Bay and ultimately the Atlantic Ocean. Floodwaters caused the total failure of the Bay Park Wastewater Treatment Plant. In order to put the plant back in service, it was necessary to install a temporary sludge dewatering system. It is anticipated that this operation will continue until the completion of the repairs to the plant. The plant had been operating in compliance with its NYS Department of Environmental Conservation State Pollution Elimination System (SPDES) permit for more than a year thanks to initiatives put forth by the Legislature and administration. Superstorm Sandy also damaged 41 of the 57 pumping stations throughout Nassau County, where localized flooding was in excess of 10ft in buildings causing many pieces of process equipment to be submerged along with a variety of electrical equipment. Inoperability of the Pump Stations resulted in the leakage of storm water mixed with sewage via ruptured pipes, surcharging at manholes and in residential and commercial basement drains. Immediate efforts by the County resulted in 34 of the 41 damaged Pump Stations being repaired and operational within less than a month of Superstorm Sandy’s landfall. Nassau County spent $38 million in emergency response services to restore these operations. • measures are being implemented at Pump Stations, including activities such as providing dry pit submersible sewage pumps, rising electrical and control panel equipment, providing quick-connects for portable generators and adding watertight manhole covers and hatches. Repair of West Shore Road and its seawall is the largest post-Superstorm Sandy road repair and resiliency project in Nassau County. To date, Phases I and II have been complete and more than 5,000 linear feet of seawall and roadway – which collapsed as a result of Superstorm Sandy - has been reconstructed. Phase III is currently in the design stage and work will go out to bid in early 2016. Additionally, the County is investigating the condition of the Bayville Bridge which requires repairs. During Superstorm Sandy the emergency generators for the Bayville Bridge, as well as the Long Beach Bridge, were flooded and inoperable hindering navigation and vehicular traffic. Nassau County has constructed a new emergency generator that is located above the flood elevation to mitigate against the loss of operation of the bridges after large storm events. Superstorm Sandy also resulted in damage to County hazmat trucks used as emergency rescue vehicles. In the performance of this work they were subjected to saltwater flooding. The County has taken delivery of one vehicle very similar in size and function to the original and has recently received bids for 4 smaller vehicles that will address the same function. During Superstorm Sandy, DPW deployed vehicles and equipment needed to assist in storm-related activities. Saltwater flooding resulted in 53 of these combined vehicles/equipment being destroyed. Furthermore, 26 DPW vehicles/equipment were parked at the Bay Park Wastewater Treatment Plant. These vehicles/equipment were subjected to storm surge which required repairs to keep them in service. Additionally, a total of 15 Police Department vehicles were damaged beyond repair due to storm surge flooding. FEMA has allocated funds for the replacement of these vehicles. The Nassau County Police Department Marine Bureau - located adjacent to the Bay Park Wastewater Treatment Plant - is a facility where all major patrol vessel repair work is conducted. The facility covers 15,000 square feet of space, and is located on 4 acres adjoining the waterfront. As a result of Superstorm Sandy, the fueling pumps were damaged and could not provide much needed fuel and services to the NCPD fleet. An upcoming project to storm-harden the fueling station and the administration building will permit the NCPD to operate more efficiently especially during storm events. The Marine Bureau project will be constructed in the spring of 2016. • 50 Portable Traffic Signal Trailers were purchased using Capital Funding in the amount of $1.5 million. These solar powered trailers will be deployed whenever traffic signals are damaged for an extended period of time. These portable signal trailers can also be deployed for temporary traffic control or to assist in evacuation of coastal areas. • 8 Portable Message Sign Trailers were purchased using Capital Funding in the amount of $120,000. These solar powered trailers will be deployed to assist in evacuations. Motorists will receive information directly from the Traffic Management Center via wireless link to the sign trailers. • Emergency Generator Trailers were purchased using Capital Funding in the amount of $240,000. These cargo trailers will be utilized to power traffic signals at major intersections in the event of a wide area power outage. • 6 Traffic Camera Trailers were purchased using Capital Funding in the amount of $150,000. These solar powered trailers will allow Operators at the Traffic Management Center to view real time traffic conditions at locations as needed during storms or evacuations. • 2 Highway Advisory Radio Trailers were purchased using Capital Funding in the amount of $80,000. These solar powered trailers will allow Operators at the Traffic Management Center to transmit real-time traffic information to motorists using the AM radio system. Motorists would tune to a preset AM radio frequency and be able to make informed decisions on their travel route. These trailers will be especially beneficial during evacuations of coastal areas, but will also prove helpful following the storm in guiding people back into damaged areas. • 2 Incident Management Response Trailers were purchased using Capital Funding in the amount of $80,000. Filled with roadway safety devices such as cones, barricades, and portable signs, these cargo trailers will be used to help detour traffic in an organized manor in the event of planned or unplanned closures of roadways. The South Shore Traffic Signal Infrastructure Improvements is a proposed construction project that will be completed utilizing an 80% subsidy from the Federal Highway Administration in the amount of $38 million. This project will replace traffic signals, communications and infrastructure damaged from Superstorm Sandy. The project will rebuild 145 traffic signals, upgrade communications to fiber optic, and install traffic surveillance cameras and changeable message signs. Work will take place in Long Beach, Island Park, Oceanside, Point Lookout, Lido, Atlantic Beach, Hewlett, Woodmere, Valley Stream, Freeport, Bellmore, Massapequa, Lawrence and East Rockaway. The RFP for Engineering Design Service has been advertised and design is divided into 5 construction projects. The first construction project will be bid 9 months after the design commences, and the other construction projects will be ready in 3 to 4 month intervals. Each construction project will take approximately 18 months but will run concurrently with staggered start times to help combat construction related traffic congestion. The Signal Management System (SMS) Upgrade is a proposed modification to the Existing SMS system in the amount of $100,000. This upgrade to the County’s existing traffic signal infrastructure database will add a “Disaster” module that will allow field personnel to triage and document equipment damage in real time using iPads. This system will allow for a more efficient damage information collection system and ensure that information collected conforms to Federal Guidelines. Real time triage information will allow Traffic staff to direct resources on an emergency basis establishing an order of importance based upon information received. A contract amendment and request for additional funding will be considered by the Legislature in November. Once approved, the design firm will begin work utilizing previously encumbered funds. Superstorm Sandy destroyed Bay Park in East Rockaway. Reconstruction is now complete. The berm on the main road - Marjorie Lane - was shifted closer to the new berm, allowing for new turf baseball fields to be constructed and providing for better access to the bulkhead along East Rockaway Channel. The work raised the field level by three feet and includes new drainage and storm water infrastructure, including a bio-filtration process to allow storm water to slowly infiltrate the ground and remove additional pollutants before discharge into the Channel. Construction commenced in June 2014. Nassau County lost the pumps that operate the North Woodmere Park and Wantagh Park pools. The County is hardening the facilities to prevent the pool pumps from being flooded and providing an emergency generator to each of the facilities, thus mitigating potential future damages by ensuring the pumps remain operational. North Woodmere Park’s backflow preventers for the potable water service and the irrigation system servicing the North Woodmere Golf Course have also been raised above the flood elevation. Wantagh Park’s electrical distribution system was also damaged during Superstorm Sandy. The electrical distribution system was mitigated to raise the transformers and switchgear above the flood elevation. Superstorm Sandy destroyed the Yacht Club and Community Center at Wantagh Park. This project encompasses a wide scope of work, to include demolishing the existing yacht club building which was compromised by storm surge. In its place, a hardened pre-cast ‘lighthouse’ structure will be installed which will house all existing utilities, and also add cosmetic appeal. A new addition is also being built at the Administration Building to replace the facility lost at Cow Meadow Park. A glass façade will update the look of the facility and it will be used for community affairs. The project is scheduled for completion in 2016. Superstorm Sandy allocated funds will also be used to revitalize Milburn Creek Park. The Park’s bulkhead will be replaced and a kayak launch will be constructed as well as a boardwalk. The Park’s lighting will be replaced and a new bathroom facility will be added to the Park. All new fence and netting has been installed on the batting cages at Eisenhower Park that were damaged by the storm. Pictured: (First row from left to right) Legislator Denise Ford, Legislator Howard J. Kopel, County Executive Edward P. Mangano, Presiding Officer Norma Gonsalves, Legislator Rose Walker, DPW Commissioner Shila Shah-Gavnoudias. Second row from left to right: OEM Commissioner Craig Craft, Chief of Patrol Frank Kirby, Fire Marshal John Priest, OEM Deputy Commissioner Paul Wilders. Subject: LongIsland.com - Your Name sent you Article details of "Mangano: Post-Superstorm Sandy Mitigation And Resiliency Projects Continue Countywide"